There are authors for whom writing functions as a form of truth-telling that requires art, but humanity as well. We look to them for insight and intelligence and good humour, and a willingness to share – and Beth is one of them. In Vagabondage – Beth’s memoir about the year she lived in a campervan — you will find again the particular characteristics of her writing that readers have so admired in her previous books, How to Conceive of a Girl and Things in a Glass Box. To nominate some of the themes in Vagabondage, I would say the search for a sense of home is right up there. In this she is a female Odysseus, and one very much for the times. She negotiates a route that is at least as tortuous as that hero of Greek myth. She must find a way past her own six-headed Scylla, and past her own rocks of Charybdis. But Beth’s are modern perils — hers is the journey to Ithaca taken via Bondi… the Great Ocean Road… and the Hume Highway… among other very Australian hazards. There are adventures and misadventures aplenty on this particular journey. And some of the misadventures struck me as very typical of Beth’s writing: prosaic and mythic at the same time. At a certain point in her travels, for instance, she has the misfortune of colliding with and killing three stray birds on the road. Now tell me THAT doesn’t trigger grief and guilt in the contemporary voyager! But at least she does not have to journey to the Underworld… Or, maybe she does? I’ll leave that to the reader. Here’s a section from the poem, ‘The Shipwrecked Coast’, where she recalls a time recuperating from an illness in a house on the Great Ocean Road twenty years earlier. I’d rise eventually, of course. and I would come to grief again. Is that a form of swimming? and I had to make my way back to the city. My car a little rustier. while I was backing out the car. It chatted to me and to its reflection for ages. it had a message for me. and pull the Van in amongst a forest of buses. Across the road, the house, still there. I watch it for a long time. and the sand is cold. and the doors clanging shut. But there are a myriad of encounters and adventures along the way – welcome and also unwelcome. Vagabondage is a short – or shortish – work that leaves you feeling you’ve read a much longer one. There are many reasons for this, not least her close-focused but at the same time expansive and warm angle on the universe. The book left me with many pleasing thoughts, including that it was a book of wisdom gained. Here is what comes from having lived, in ways that you may or may not have expected, and through events you may or may not have wished for. All presented with a deceptively simple but pleasurable aesthetic. A kind of refractory mood pervades the work (he said, trying not to sound academic, but not knowing how else to describe it). Maybe, in other terms, there’s that sense of a storm having passed for the author. She has come to understand the storm’s outlines and its import, the shape of the clouds overhead and the meaning of those rays and colours that break through and lead you to understand every so often just who you are, and indeed, how to go on. This kind of writing comes from gestation, thoughtfulness, in-dwelling. It is not driven by any ‘story-telling’ or ‘genre’ imperatives. And yet there is plenty of story, and incident, as well as interiority and introspection. It’s all in all a marvellous blend. With this book Beth proves to be that most welcome being in a world oversupplied with ego-driven verbiage: the unprolific writer. The kind of unprolific writer who creates the stuff that we need so as to better understand who we are, where we are, as men and women, here, in this place. And the kind of stuff that will also last; that other generations will seek out to understand the texture and the exactness of life as it was lived, in this case, by one woman, bravely, with good humour and love; but who could be and is many, many more than herself. Ladies and gentleman, I commend Vagabondage and its author to you, and declare this book well and truly launched. As well as being executive Director of the ASA, Angelo Loukakis has previously worked in publishing, has been a teacher and written film scripts, and is the author of nine fiction and non-fiction books including For the Patriarch (UQP, 1981) and Houdini’s Flight (HC, 2010). 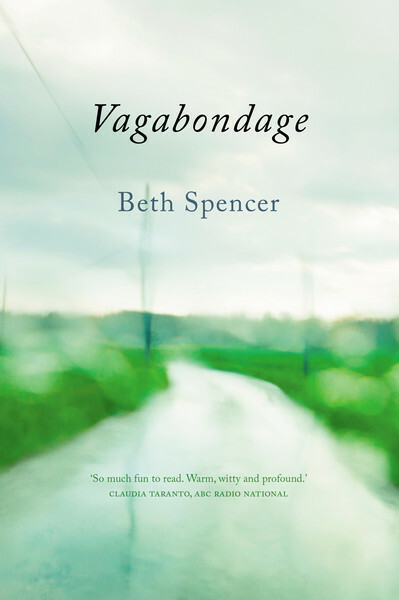 Vagabondage is Beth Spencer’s third book and her first in 18 years. It was originally published by UWAP in October 2014, and is now also available as an ebook. The paperback is available from selected bookshops, from UWAP (http://uwap.uwa.edu.au/products/vagabondage), or direct from Beth at her website. The kindle eBook version of Vagabondage is available from http://www.amazon.com/dp/B00URD7558 and a ePub version from https://store.kobobooks.com/en-US/ebook/vagabondage-1, and PDF versions on request. Find out more at www.bethspencer.com. This entry was posted in Angelo Loukakis, Beth Spencer, Issue 14, UWA Publishing, Vagabondage and tagged Bondi, How to Conceive of a Girl, Hume Highway, The Great Ocean Road, Things in a Glass Box. by Mark Roberts. Bookmark the permalink. What a beautiful review of this beautiful book!